This morning, we published the final report from the Management 2.0 Hackathon on the Management Innovation Exchange website. You can read Jonathan Opp and my blog post announcing it here. Or download the report directly as a PDF here. This was a fun process. 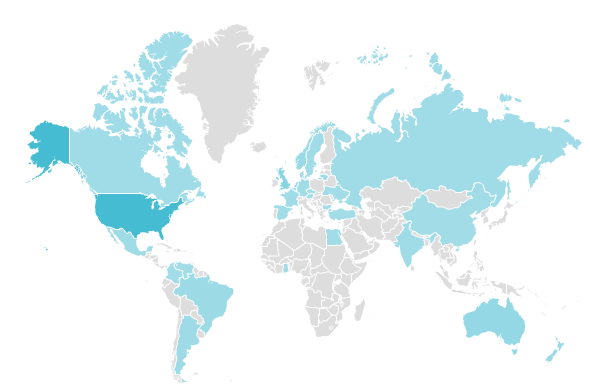 Since beginning in November of last year, the hackathon had about 900 contributors from six continents. I’ll be in Boston on Wednesday at the Enterprise 2.0 Conference highlighting some of our favorites hacks to come out of the process. So read through the report and if you find some innovative ideas for hacking management in it, or if you are inspired to attempt to hack management yourself by what you read, please let me know. I’d love to hear about it! Over the past year, I’ve had the fun job of being the Community Guide on the Management Innovation Exchange (we call it the MIX). It’s a great gig because I have the opportunity to meet and collaborate with smart folks from around the world who are interested in improving the way our organizations work. Over the past few months, we’ve been running an effort we call a “management hackathon.” We ran our first hackathon experiment last year, with a small group of about 60 management innovators attempting to uncover how to enable communities of passion in or around organizations (if you’d like to read the report highlighting our findings, go here). Our newest effort is called the Management 2.0 Hackathon, and for this one we’ve gone much bigger. This hackathon is a collaborative effort to come up with innovative management hacks based on the principles that have made the Web one of the most adaptable, innovative, and inspiring things humans have ever created. Our goal is to take the best lessons from the Web’s success and apply them to reinvent management practices in organizations. Over on the MIX website, I’ve written a few blog posts highlighting some of our recent accomplishments. Here’s a link to a post about the navigator tool we created, highlighting examples of organizations that are already using the principles of the Web to innovate today. Here’s a link to a post I just wrote late last week with some of the most innovative hack ideas that have been suggested by contributors. Sound interesting? 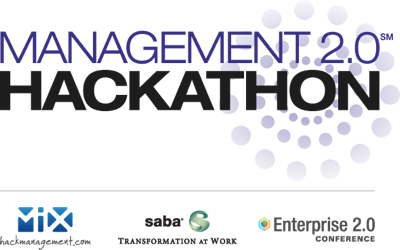 If you’d like to participate in the Management 2.0 Hackathon and share and help develop management hacks with us, it’s not too late. In fact, we’ve had almost 50 new participants join in the past week alone. 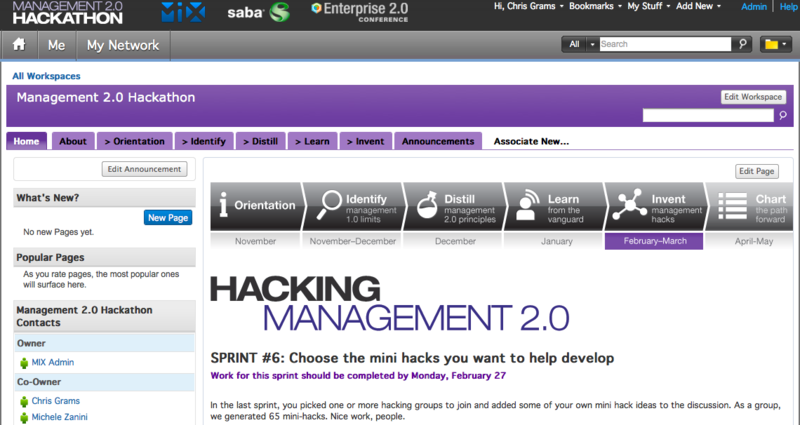 If you want to start hacking with us, go here to create your account and read the instructions for our current sprint. It’d be great to have you on the team! 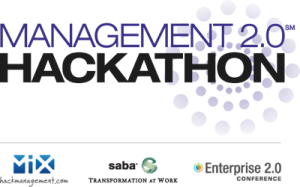 A few weeks ago at the Enterprise 2.0 Conference in Santa Clara my friends at the Management Innovation Exchange (MIX) announced the Management 2.0 Hackathon. The hackathon is a large-scale collaborative effort where folks from all around the world are joining together to develop a set of innovative management hacks that might help fix what is broken about the way our organizations operate today. I’ll be joined as the guide/facilitator for this hackathon by my MIX colleague Michele Zanini and New Kind’s own Jonathan Opp. Over the past few weeks, almost 450 people have signed up. So it looks like it is going to be a lot of fun. Today it is finally time to get started. If you haven’t signed up yet and are interested, it is very easy—just go here to create your account, then review the orientation materials and head straight to the Sprint #1 instructions. If you want to get a taste of what we are covering in Sprint #1, here’s a video introduction to the sprint from Gary Hamel. Earlier this year, some of you joined me for the Communities of Passion Hackathon Pilot over on the Management Innovation Exchange. It was a really great experience—I met some wonderful folks, and we did some pretty interesting hacking (I’ll share the results of our work later this week). Today, here at the Enterprise 2.0 Conference in Santa Clara, the MIX announced a brand new hackathon, which we are calling the Management 2.0 Hackathon. In this project, we’ll be exploring how we can harness the principles of the Web to build organizations that are fit for the future. Sound interesting? If you want to learn more about it, go read the announcement on the MIX here, then sign up and join us! It’s going to be a lot of fun. The first copies of The Ad-Free Brand showed up at the house on Friday afternoon. So I guess that means, after nine months of work, it is finally out. Awesome. This book is the work of many people. It is filled with the helpful edits and brilliant suggestions of Jonathan Opp, Rebecca Fernandez, and Rick Kughen, plus the insightful contributions of Kevin Keller, Greg DeKoenigsberg, Paul Frields, and many others. It is a product of the patience and support of my wonderful girlfriend Maggie and my New Kind friends David Burney, Matt Muñoz, Tom Rabon, and Elizabeth Hipps. There are so many people who’ve helped me out over the past year, and I owe all of them a debt of gratitude. I thought I’d share the acknowledgments from the back of the book here in the hopes of introducing you to the work of a few of the people who helped me make this book a reality. Please take a few minutes to click through the links and get to know some of these great folks and the very cool projects they are working on. I can only hope you learn as much from them as I have. One day last September, I received an interesting email out of the blue from someone named Lisa who had stumbled across a blog post of mine. She asked me whether I had ever lived in Indiana as a child. I was born in West Lafayette, Indiana. As it turns out, Lisa was my neighbor and childhood best friend. I moved to Kansas City, Missouri at age 5 and had lost touch with her until I received this email, almost 35 years later. As Lisa and I caught up, we learned we each had book publishing in the blood. Lisa is a Senior Publicist at Pearson in Indianapolis. I spent the first five years of my career as a literary agent and editor. In one email to her, I mentioned that I had been thinking of going back to my publishing roots and actually writing a book of my own. Lisa introduced me to Rick Kuhgen, an Executive Editor at Pearson. One thing led to another, and before I knew it, I was writing. So I’d like to thank my childhood friend and current publicist, Lisa Jacobsen-Brown, without whom this book would probably still be something I was thinking about doing… eventually. I’d also to thank Rick Kuhgen, a true writer’s editor—responsive, thoughtful, and with a hint of poetry to his own words. I’ve benefitted from the wisdom and friendship of many wonderful people along the journey. Thanks first to Maggie, my source of energy. This book would have never been possible without you. Thanks to my mother and father, who I hope see parts of themselves in me and in this book. Thanks to my sister, Erika, who has been a great friend and confidant ever since she quit telling on me. To Matthew Szulik, my mentor and friend, for letting the best ideas win. To Jonathan Opp for helping me find a voice. To David Burney, for opening my eyes and making me a designer. To Matt Muñoz, for always bringing optimism and passion. To Jeff Mackanic, for your friendship and for quietly, consistently making everything happen. To Rebecca Fernandez, for bringing value before words. To DeLisa Alexander, for your faith and friendship. To Tom Rabon and Elizabeth Hipps, for making each day at New Kind better than the last. To all of my friends from the Red Hat nation, past and present, around the world. Special thanks to the Red Hat Brand Communications + Design team, a group of the most talented folks I’ve had the opportunity to work alongside. To Kevin Keller, for your wise advice, guidance, and contributions. To Michele Zanini, Polly LaBarre, Gary Hamel, and the team at the Management Innovation Exchange for introducing me to a new set of friends. To Bob Young, Lisa Sullivan, Michael Tiemann, and Donnie Barnes, who were open when open wasn’t cool. To Greg DeKoenigsberg, Jeremy Hogan, Chris Blizzard, Paul Frields, and Max Spevack, who know more about inspiring communities than I ever will. To Kevin Trapani and Dan Moore, for inspiring us to consider a better way. To Alina Wheeler and Jelly Helm, for perspective, at the right time. To the rest of the Pearson team, especially Seth Kerney, Megan Wade, and Bill Camarda, for all of your hard work bringing this book to life. And finally, thanks to my other friends who don’t give a crap about brands, ad-free or not. You know who you are, and I appreciate everything you do. You’ve been using open source software or contributing to open source projects for a long time. Perhaps you are in a job where you utilize open source tools regularly, or maybe you are just fooling around with them for fun or to learn new skills. Did you ever consider that your time spent participating in these open source communities might be more than just good technology experience? That it might prepare you for jobs completely unrelated to using or making software? In college, I studied history and political science. Not because I wanted to be a political scientist or a historian but because, well… actually I’m not really sure. But in retrospect, I’m really happy I studied these fields. Why? They gave me plenty of experience doing research, writing, and learning to articulate my thoughts and ideas effectively. While I don’t remember how Alexander the Great defeated the Persians at the battle of Issus and I can no longer compare and contrast the views of Rousseau and Locke effectively, I use many skills I learned when studying these subjects on a daily basis. At the risk of sounding like an advertisement for a liberal arts education, let me get to the point. While you’ve been happily participating in open source communities because you have a need for a piece of software or want to help make it better, you may also be the beneficiary of an important side effect. 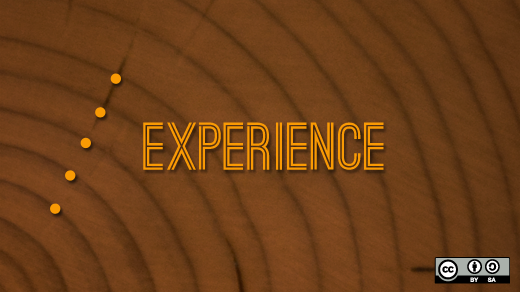 You may be getting experience in how organizations of the future will be run. Over the past few years, I’ve had an opportunity to work with organizations in many different industries, including finance, education, service, hospitality, even in the government and non-profit worlds. Many of these organizations are busy exploring how they can better compete using techniques that many of us in the open source world have already successfully put into practice. For example, some are interested in testing large-scale collaborative projects involving people outside their organizations. Others want to know how to create internal meritocracies where people feel empowered and the best ideas can come from anywhere. Others want to begin to form more meaningful relationships with the community of people who care about their organizations. If you’ve been reading opensource.com, you’ve seen us highlight many examples in business, government, education, health, and elsewhere. These organizations have a lot to learn from those of you who already have real experience using these practices in real communities. In his book Outliers, Malcolm Gladwell introduced the idea that those who became world-class practitioners at their craft (he uses examples like Mozart, Steve Jobs, and the Beatles), have done so in part because they were able to get an inordinate amount of practice before others in their field. According to the research Gladwell cites in the book, a person needs about 10,000 hours of practice to achieve mastery. How close are you to putting in 10,000 hours participating in the open source world? If you’ve spent 40 hours a week working in open source communities for 5 years, you may have your 10,000 hours in already. But even if you don’t yet have 10,000 hours, my guess is you’ve already learned quite a bit about how open source communities work. So if you believe that the organizations of the future may be run using many of the same principles that are currently being used to great effect in open source communities, and you already have plenty of experience working within those communities, could you be an asset to an organization that is looking for better ways to compete? And could you be an asset not just because of your open source technology skills, but also because of your open source thinking skills? An example: My friends Dave Mason and Jonathan Opp, who each have well more than 10,000 hours of experience in the open source world, recently entered the joint Harvard Business Review / McKinsey M-Prize contest on the Management Innovation Exchange with a hack deeply inspired by their open source experience. Their idea? Take the principle of “forking” as practiced in open source development projects and apply it to the way organizations are managed (read the full details of their hack here). Their “Free to Fork” hack was recently selected from a pool of almost 150 entries submitted by people from around the world as one of 20 finalists for the M-Prize. Pretty impressive. So think about it: Beyond your technology experience, what else have you learned from working in open source communities that might be valuable to a potential employer? Are there hidden skills or ways of thinking open source has taught you that might be worth highlighting in a job interview or in making the case for a promotion or new assignment? Start thinking of your open source experience as a new set of thinking and working skills that may be very much in demand in organizations hoping to remain competitive in the future. By doing so, you might open yourself up to interesting opportunities you wouldn’t have considered before.